I started an easy project - a scarf using the the Double Bump Scarf pattern. 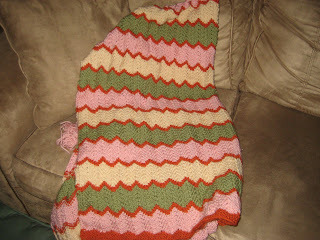 I've made several facecloths from this pattern, meaning to give them as a gift but they still sit on my kitchen table. 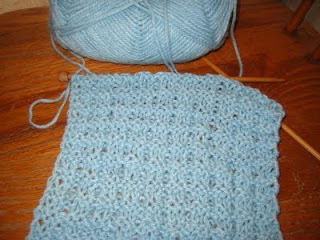 I took a knitting class several months ago and ended up with a skein of this light blue yarn. I figured I could do a scarf and maybe have enough left over for a matching hat. We'll see. In the meantime, here's the little bit of progress on the scarf. 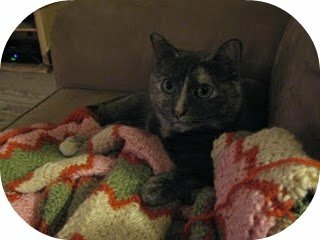 My afghan is getting heavier on the needles and now drapes over my legs while I'm on the couch, knitting. I'm not sure how much more I'm going to knit but the pattern it's based on recommends at least 57 inches of the pattern, which does not include a two-inch bottom and top border. I imagine that I will keep going until I use up all the yarn I bought for this project. Mr. Grumpbump hates it when I have random left over yarn. Mr. Grumpbump and I looked at another house today. While I liked it, and the price was certainly right, our chances of actually getting it are slim. There are already three other offers on the table for the house. The house does not have a pool, but it does have a big backyard and an enclosed Florida room. We are going to add our offer to the mix.